Southampton boss Mark Hughes is convinced his old club Chelsea are genuine contenders for the Premier League title this season. The Saints host Chelsea in the first match of a live Renault Super Sunday double-header headlined by Liverpool against Manchester City in a mouthwatering clash billed as 'Challengers vs Champions'. Maurizio Sarri's side remain unbeaten heading into this weekend's encounter at St Mary's, and Hughes believes the star quality in Chelsea's ranks will see them in the title mix come the end of the season. "I think Chelsea will always be a contender," said Hughes, who spent three seasons with the Blues as a player during the 90s. "You see the quality of their squad. They made changes [against Vidi] last night but you look at who they brought in and they are still high quality. "The strength and depth they have got is comparable to all the other top teams, so they will go close. "They have a new manager and it seems that when Chelsea change a manager that initial season seems to be the one that they are really strong in. "The way in which they go about their business is that they chop and change coaches and managers but it doesn't seem to affect their ability to win games and win trophies. "I feel, given what I have already seen, they will have a strong season this year and go very close. "They're playing slightly differently, they seem more expansive and look like they are trying to press more from the front but they still have individual talent, who have performed in the last few years and made all the difference in key games." 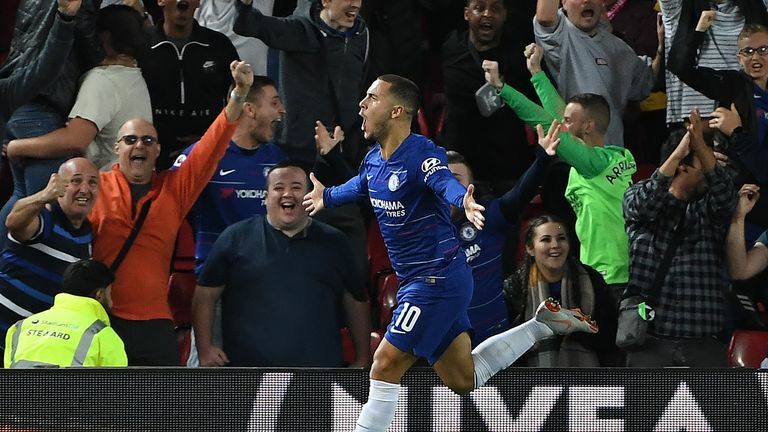 Eden Hazard has been instrumental in Chelsea's highly-impressive start to the season and Hughes admits he is a huge fan of the free-scoring forward. "He (Hazard) is an outstanding player. You look at his stats this year and he has made an impact in almost every game he has played," Hughes said. "One stat which surprised me was that he has only had nine shots on goal in five Premier League games and he's actually scored six goals, so that's not a bad return! "The key is stopping their key players from having opportunities if you can. "It's very difficult in the Premier League to stop any opposition team from having chances. We've just got to hope the chances that they (Chelsea) create fall to somebody else."